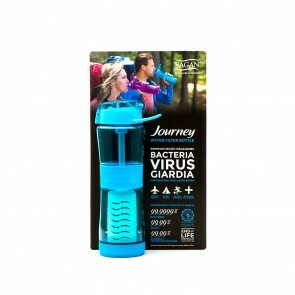 A new level in water purification! Water filtration systems by Sagan. The Kelly Kettle boils water outdoors in just 3 - 5 minutes using just a handful of fuel such as sticks, Pine cones, Birch bark, Dry grass, etc. Want to Cook? Simply drop our Hobo Stove accessory onto the steel fire-base of the kettle and cook away! 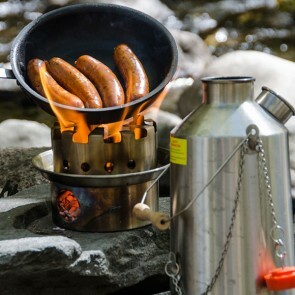 The Kelly Kettle and Hobo camp stove makes boiling water & cooking, fast and easy in the outdoors. Perfect for Fishing, Hunting, Camping, Trekkers, Scouts, power cuts, people working outdoors or fun family picnics. Have a look at our Pictures and read what users say in our Testimonials. Order yours today and have it delivered to your door! To get the shipping costs, simply "Add to Cart" the product you are interested in, then enter your State and Zip Code to calculate the shipping amount. We offer FREE GROUND SHIPPING within the Lower 48 States on all Ultimate Kits. If shipping to AK, HI or Canada, please email us. Kelly Kettle products are also available in most good Outdoor Stores in the U.S. and Canada. 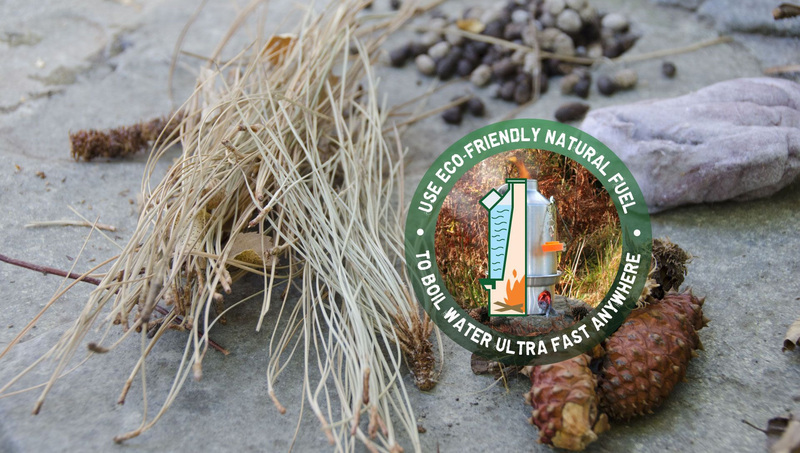 The most reliable ultra-fast Camp Kettle & Camp Stove for the outdoors! 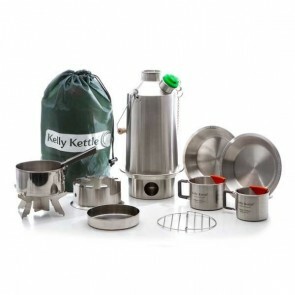 Kelly Kettles for Camping, Picnics, Scouts, Fishing, Hunting, The Beach, Outdoor Fun, Power Cuts, etc. Boils water Outdoors within 3-5 minutes. Works with any fuel: sticks, dry grass, bark, pine cones.....even dry animal dung! NO Batteries, NO Gas - FREE FUEL! Base Camp - Boils 54 fl. Packed Height 13" Width 7.3" Suits: Groups, Family Outings, Car Camping, Fishing, Emergency Preparedness. Scout- Boils 41 fl. oz. Packed Height 10.4" Width 7.3" Suits: Scouts, Small Groups or Families, Beach, etc. Trekker - Boils 20 fl. oz. Packed Height 10.4" Width 5.5" Suits:1-2 people, Backpacking, Trekking, Kayaking, Hill Walking, etc. 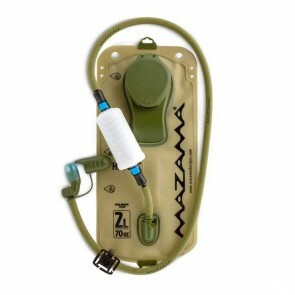 Perfect for Wilderness Survival, Emergency Preparedness, SHTF, Disaster Kits, Bug-Out & Go-Bags. The new whistle lets you know when the water is boiled. Lightweight, compact & durable. Works in extreme weather. 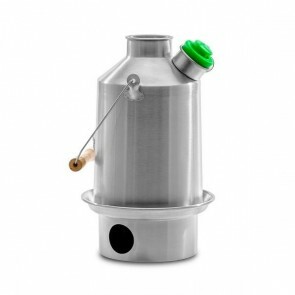 The Hobo Stove quickly turns the fire-base into an efficient wood fueled Camp Stove. No open fire - the fire is safely contained within the kettle & fire base. Over four generations, the Kelly family have become renowned for providing reliable, quality camping equipment and truly outstanding service. Read about our History and see what others say about our products and service. Then order your own Kelly Kettle today and see for yourself! The Kelly family in Ireland pioneered the development of the Kelly camping Kettle and now, over 125 years later, their unique Kettle is still boiling water quick and easy in the outdoors - even in extreme weather conditions. Any natural fuel can be used to burn and create the fire which will quickly bring the water in the kettle to a rolling boil. Since only natural fuel is used you don’t have to worry about carrying gas or batteries or other types of fuel with you. Safe and easy to use, the Kelly Kettle will be one of your most used and valued pieces of camping gear. Now with the addition of the new Hobo Stove the Kelly Kettle converts to an efficient wood fueled camp stove! Camping If you are camping and just want a convenient quick way to heat up your water for hydrating food, a cup of coffee or for personal use, the Base Camp Large Kelly Kettle is great. It will deliver about 7 cups of hot water in just a few minutes. Your camping gear will not be complete without a Kelly Kettle. Backpacking and Hiking Backpackers and hikers love the Trekker Small Kelly Kettle for its light weight and natural fuel burning ability. Never worry about carrying heavy fuel in your backpack again. The Trekker Kettle holds a little over 2 cups of water which is enough to hydrate your dehydrated evening meal and extra for a cup of hot chocolate or coffee. 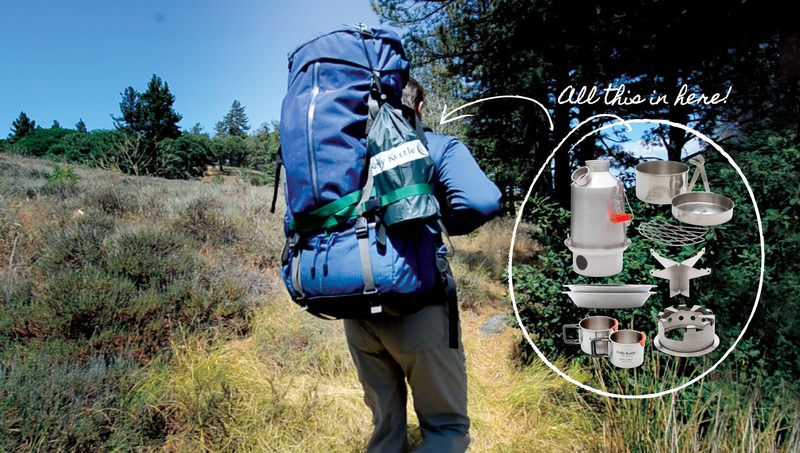 You will never go on a backpacking trip again without your Trekker Kelly Kettle. Kayaking is another outdoor sport where you don’t want to have to carry any more than necessary. Once again, the Trekker Kelly Kettle is ideal because of its light weight, use of natural fuel and how fast it will boil water when you are exhausted from kayaking all day. Scouts is a terrific youth activity and what better way to teach scouts how to camp, cook and purify water than to teach them how to use the Kelly Kettle. The Base Camp Large Kettle and the Scout Medium Kettle are both perfect for scouting activities, competitions and campouts. A scout troop with kettles for each patrol is well set up to provide purified water for use in cooking and personal hygiene for each member of the patrol. -- Not that scouts necessarily worry about the later but at least they have the option. Fishing and Hunting >The Kelly Kettle was created to quickly produce hot water for coffee and other hot drinks while fishing on the beautiful lakes of Ireland. The same is still true today. All three sizes of kettles are well suited for the fisherman or hunter depending on the size of the group and whether you are backpacking into a remote area to catch the big fish or bag the trophy deer or elk or just setting up camp for a leisurely outing. Emergency Preparedness and Survival The KellyKettle is an essential element of any emergency preparedness plan. 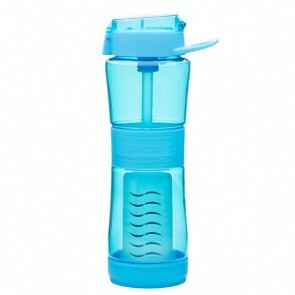 In an emergency or disaster situation the most important part of survival is being able to obtain pure water. Without access to other types of fuel such as gas or propane, it may be difficult to get pure water. 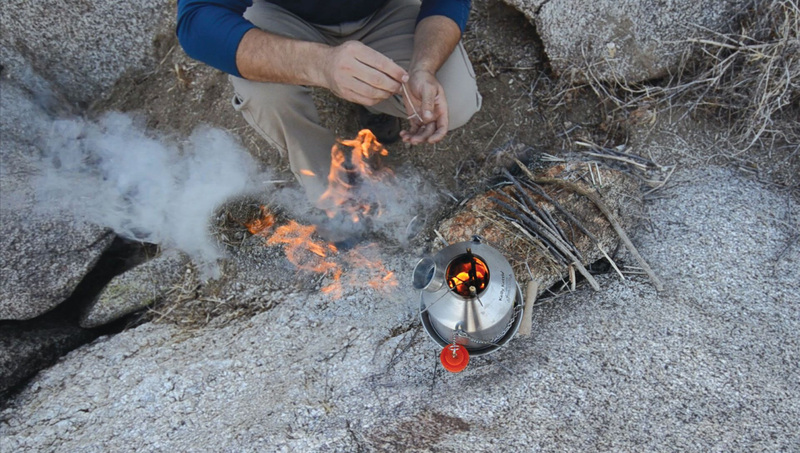 Since The Kelly Kettle uses only natural fuels, in a disaster you most likely will still have access to ample natural fuel in order to boil and purify water for drinking, cooking and personal hygiene. 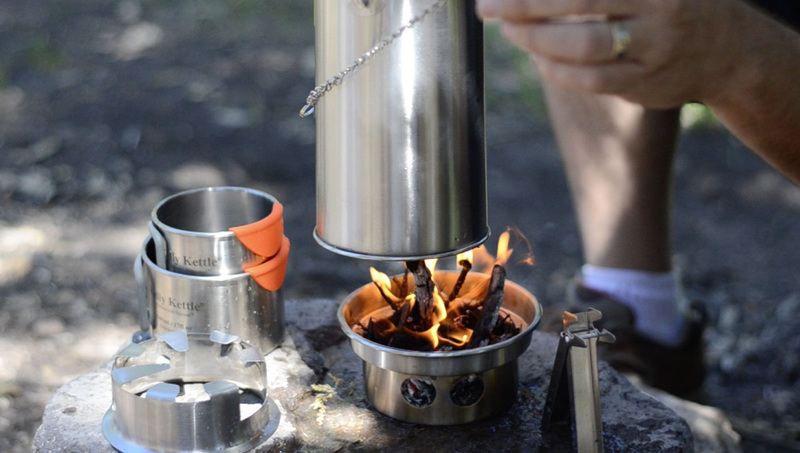 The Kelly Kettle is available in three (3) sizes made from aluminum or stainless steel. Some New Accessories for 2019 - see what you might have missed! Base Camp Large Kettle: This kettle holds 54 oz or about 7 cups of water and comes in aluminum or stainless steel. Scout Medium Kettle: This kettle holds 41 oz or about 5 ½ cups and is available in aluminum or stainless steel. Trekker Small Kettle: This kettle holds 20 oz or a little more than 2 cups and is available in aluminum or stainless steel. Cook Sets - Large & Small: Comprising a Pot, Pan/Lid, Grill Set & Gripper Handle. All stainless steel. Great for heating food over the top of the kettle and cooking food over the fire in the base. Hobo Stove: Drop the Hobo Stove onto the fire-base of the kettle to turn it into an efficient wood fueled camp stove. Fuel with stick and cook away using any size Pot or Pan! Frying or Stewing food is easy with the Hobo Stove. When finished, the Hobo packs away neatly inside the fire-base for easy transport. 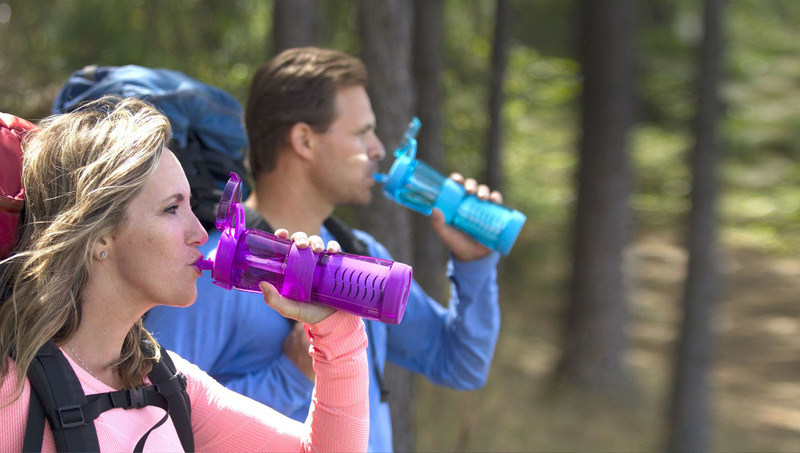 Camp Cups: Stainless steel camp cups have a cool lip guard and store inside one another. Another great addition to your Kelly Kettle outdoor gear. Base/Pot Support: This NEW VERSION (2019) is multi functional. 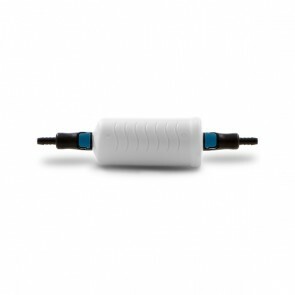 It allows you to either, a) prepare fast cooking items like Rice, Oatmeal, Noodles, Soup, etc. 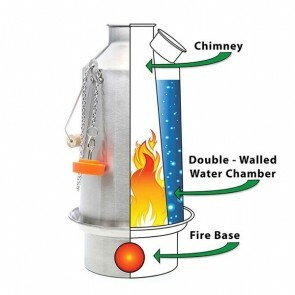 overthe chimney of your kettle as it boils or b) Use it to level uneven ground under the fire base or simply to eliminate scorch marks to lawns, timber decking & picnic tables. 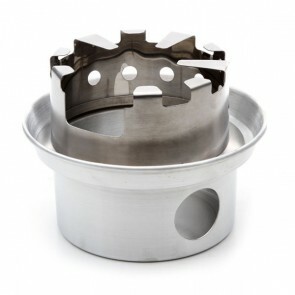 Camp Plates/Bowls: Made from food grade stainless steel. The plates are 1" deep so great for stews and chilis. 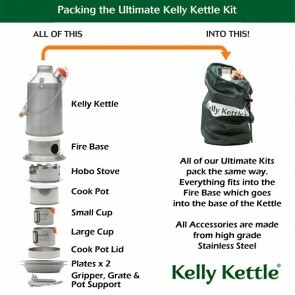 Marketing the Kelly Kettle and Kelly Kettle Accessories to your customers is easy! We are here to help! Lots of product images, user guides, spec sheets and videos of the Kelly Kettle are available on Kelly Kettle Marketing you can use to send emails, build promotions and sell more Kettles! Kelly Kettle® & Volcano Kettle® are Registered Trademarks of the Kelly Kettle Co. I like the new design, Looks kind of crazy but still works great. Could you please make these for left handed people? I love mine but it make it awkward to use the knife side backwards. I have had this system for just short of two years. I got it as a belated birthday present. I have been using it seriously for the last 18 months. © 2019 Kelly Kettle Company. All rights reserved. Kelly Kettle® & Volcano Kettle® are registered Trademarks of the Kelly Kettle Company.